The Eco Coco Hydrating Hair Treatment contains a unique blend of natural and Certified Organic ingredients including Coconut Oil, Acai Berry, Goji Berry and Aloe Vera. It is enriched with the highly moisturising and nourishing ingredients of Vitamin E and Panthenol that work together to strengthen your hair. Certified Organic Coconut Oil effectively reconditions dry hair due to its unique molecular structure, which unlike other oils, penetrates the hair shaft, to repair and prevent damage from the inside, out. Lauric Acid and Capric Acid (naturally present in Coconut Oil) help to restructure and increase hair’s strength by preventing protein loss. 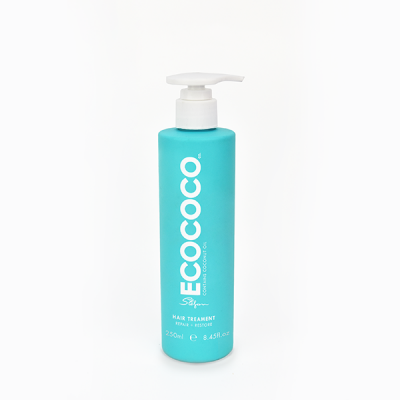 ECOCOCO Hydrating Hair Treatment 250ml. NATURAL | CRUELTY FREE | CONTAINS 100% CERTIFIED ORGANIC COCONUT OIL. 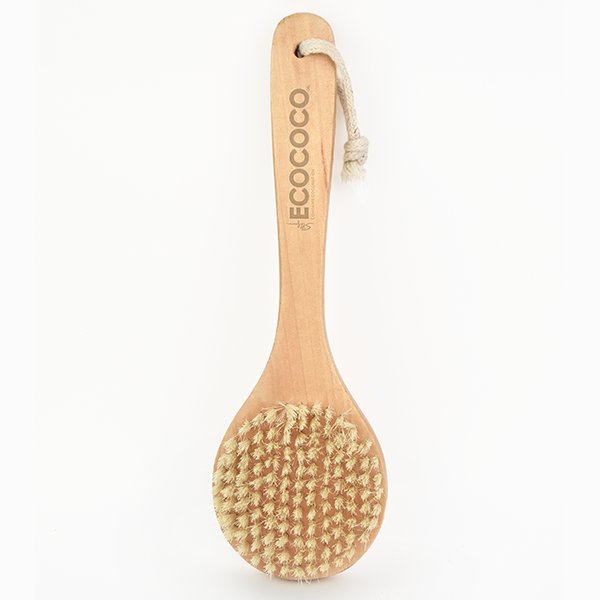 The ECOCOCO philosophy is to offer products that use the most pure, revolutionary and advanced ingredients. The ECOCOCO Hair Treatment contains a unique blend of natural and Certified Organic ingredients including Coconut Oil, Acai Berry, Goji Berry and Aloe Vera. It is enriched with the highly moisturising and nourishing ingredients of Vitamin E and Panthenol that work together to strengthen your hair. Certified Organic Coconut Oil effectively reconditions dry hair due to its unique molecular structure, which unlike other oils, penetrates the hair shaft, to repair and prevent damage from the inside, out. Lauric Acid and Capric Acid (naturally present in Coconut Oil) help to restructure and increase hair’s strength by preventing protein loss. Organic Aloe Extract contains B Complex, Folic Acid, Vitamin C and Carotene that together work as a natural anti-oxidant and anti-inflammatory to strengthen your hair. This revolutionary, hydrating treatment is sulphate and paraben free. Directions: Ensure hair is towel dried. Pump 2 squirts into the palm of your hands and massage into your mid-lengths to ends. Leave on for 5 minutes. Rinse thoroughly. 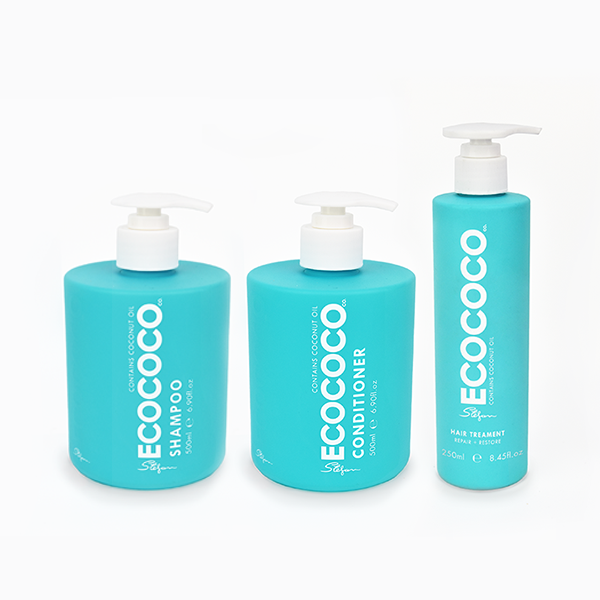 Use approx 2 – 3 times per week after washing your hair with ECOCOCO Shampoo and Conditioner. Made in Australia | Not tested on animals. Covering eveything from Counter Display Stands, posters and brochures ECOCOCO has designed and developed all your marketing requirements to ensure you get the best opportunity in selling the range in your store. We have technology available to supply you with social media imagery and in house designers to customise your individual marketing needs. Here at ECOCOCO we have a strong and active emphasis on education and training, we believe knowledge is power and the key to making our range a success in your store. We provide training manuals and offer Skype calls if you are far from the ECOCOCO headquarters. 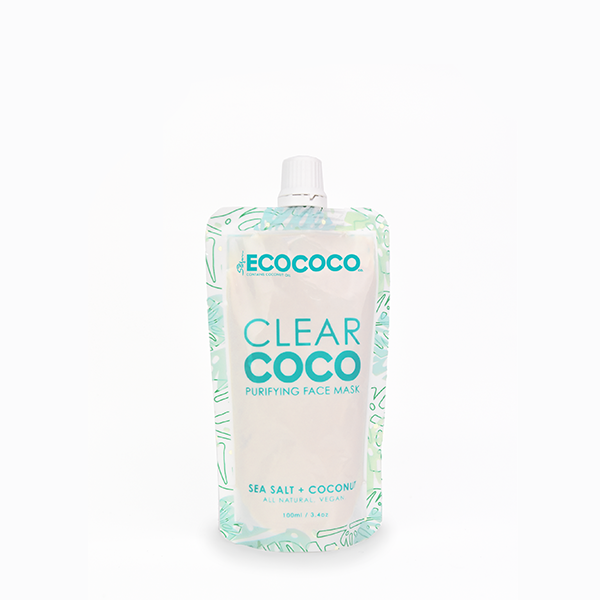 After being in the market for two and a half years, we believe that the ECOCOCO range has found a niche sector by offering our clients a professional range and complementary take home retail range.